Win A "Fall Run" Cape Cod Surfcasting Trip! Win a “Fall Run” Cape Cod Surfcasting Trip! Start a membership before September 1st and be automatically entered to win a fall run Cape Cod surfcasting trip with me! The winner will explore and fish a beautiful and remote section of beach here on Cape Cod with myself and another member from MFCC, during either September or October (whatever works best for your schedule). I can't guarantee "trophy fish" but I can guarantee a memorable experience. Even if the fishing is slow, we will still be able to explore one of the Cape's most beautiful and wild places, and you will learn a lot. On September 1st I randomly selected one brand new member from My Fishing Cape Cod who signed up before September 1st, and one veteran member who left a comment below, to accompany me on this trip. 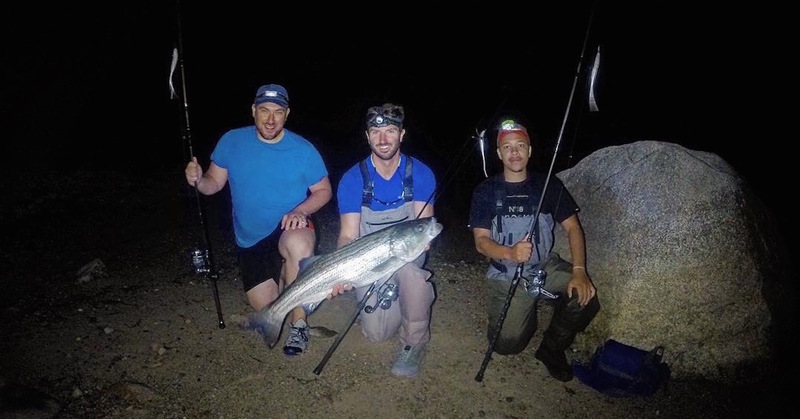 We caught several schoolies and a 35 inch striper during a recent surfcasting trip to the boulderfields with MFCC members Matt Hallowell (left) and Lamont Lopes (right). We will more than likely time this trip around high tide. There is a good chance we will either hike out into the dunes to access remote stretches of beach, or utilize my truck and actually drive out onto the sand. I had such a great time fishing with Ryan. When I first met Ryan he was very kind and asked us many questions so he could get to know us. He brought us to a beautiful spot where I started off with a topwater plug. At first I was not having much luck, but then Ryan hooked a fish and he let me reel it in. From there on I was on fire and I caught 8 stripers! I will never forget the last fish I caught because it was absolutely huge. I had such a great time fishing with Ryan. Thank you Ryan for letting me share a wonderful afternoon with you. On a beautiful Cape Cod Friday I headed out on a guided surfcasting trip/lesson with Ryan. The sun was shining, the water glistening, the stripers were biting and we enjoyed it all while walking the magnificent beaches of the Lower Cape. Plus we finished the day with a spectacular sunset. Thank you Ryan for letting me share such a wonderful afternoon with you. I look forward to watching and reading about your future adventures and successes with MFCC. The great value of a trip with Ryan is in all the extra details that you wouldn’t think to do on your own. With Ryan, you learn nuances of timing your fishing trip with different tides and locations, as well as technique. 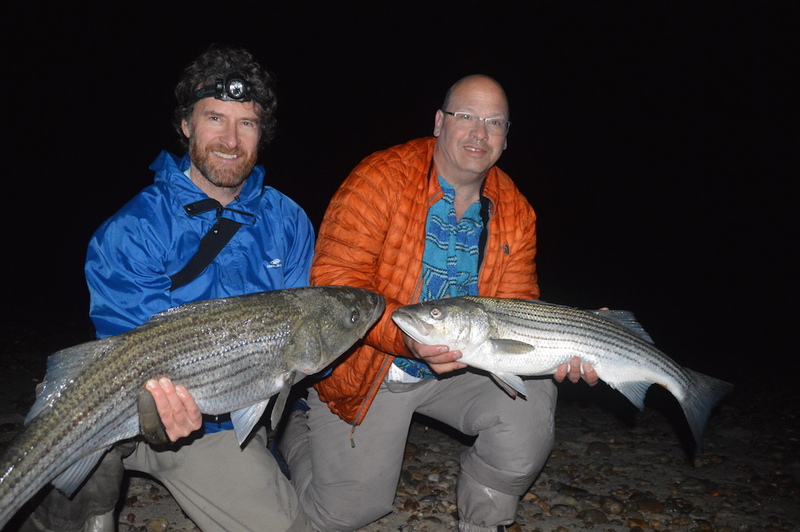 On our trip we were rewarded with catching stripers of up to 37 inches on a beautiful stretch of beach under the stars. Cant get much better then that. What a great night on the beach. Thanks for showing me around and sharing your knowledge. And that fatty keeper was awesome. I appreciate you slicing up some fillets for me at end of the night. Looking forward to getting out there again with you sometime. Thanks again! Perfect weather, breath taking scenery, and even better company - I had an amazing experience. Ryan never ceases to amaze me… there we were with water as far as the eye can see...miles and miles of secluded beach in every direction, and Ryan gets us on the fish. Nothing more fun than stripers on a fly rod! Thanks Ryan – I had a blast! I rediscovered what I love about fishing thanks to MFCC. I had the trip of a lifetime with Ryan, and I would give the experience, knowledge, equipment and instructions 5 stars. I rediscovered what I love about fishing with MFCC – top-notch! My grandson and I will always recall that we started this journey with you as we embark on our new hobby of surf casting. 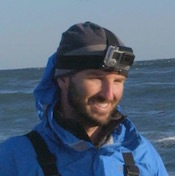 Hello Ryan, your passion for fishing the waters of Cape Cod is infectious. That you took my grandson, Adam, and I to one of your "secret spots" speaks volumes about your generosity and eagerness to include others into the thrill and beauty of surf casting. The fabulous setting was enhanced by the gentle breezes and scenic sky. I especially enjoyed the nuance of reeling speed and rod action for the various types of lures. Catching and landing stripers was a bonus as the look of joy on Adam's face was a memory imprinted forever. That you took the time to capture the moments on your camera, was an additional component of the highly enjoyable adventure. A life long resident of the Cape, I gleaned so many tips from you; my grandson and I will always recall that we started this journey with you as we embark on our new hobby of surf casting. I am really glad to have found My Fishing Cape Cod. The discovery of MFCC led to one of the best guided fishing trips I have taken - and I've taken lots of fishing trips in the last 35 years. This was my first time fishing in Massachusetts and I feel fortunate to have connected with Ryan as I doubt there is a friendlier, more knowledgeable guide out there. Thanks again Ryan for putting me on the fish! I highly recommend a fishing trip with Ryan! Being relatively inexperienced at fishing, spending time with Ryan and tapping into his vast knowledge was wonderful. Ryan answered all of my questions and heightened my passion for fishing, without treating me like an amateur. I highly recommend a fishing trip with Ryan! Thanks for a memorable adventure fishing the beach last night. We had a strange turn in the weather, an equipment failure, and lost a big one. But we also caught some keepers, laughed and fished with new friends, and brought home some sweet filets. Can hardly wait to do it again. The beach we fish during this trip will be decided upon by me, about 24 hours prior to the day of the trip. I will pick a location based off the tides, weather and fish behavior. You are free to bring your own gear, but I can also supply all lures, rods and reels if needed. The tackle and equipment which I can supply for you includes brand new Van Staal reels from the Goose Hummock Shop in Orleans. Chris Rhoads (left) and Dan Winkler (right) doubled up on these solid stripers around 11pm while fishing with me during a June guided surfcasting trip. I can bring anyone of any experience level with me on a trip like this. If you are a beginner then have no worries! I can lend you equipment, provide you with basic instruction, and give you a lesson. As mentioned above, to be entered to win you must start a membership before September 1st. If you are already a member, then you can get your name into the drawing by leaving a comment at the bottom of this post. I have several in-depth reports published here on MFCC about some of my 2018 guided surfcasting trips. I would recommend clicking the links below and reading these reports to get a better idea of what to expect during this trip. Once again all you have to do for a chance to win is start a membership before September 1st. If you are already a member of My Fishing Cape Cod, then just leave a comment below along the lines of "I'm in!" to be entered. On September 1st I will randomly select the two winners. The trip will be scheduled for sometime this September or October (whatever works best for your schedule). Please let me know if you have any questions. I am already looking forward to this trip - it will be here before we know it! Get Entered For A Chance To Win! Start a membership before September 1st to be automatically entered. If you are already a member, then leave a comment below saying "I'm in!" to be entered. Ryan, I hadn’t seen the picture of you and the lad before I spoke to you last night, there you have it, picture is worth a thousand words! It sure is Jane! Great seeing you and Tom the other night on the water. Wow so popular…Count me in! I would love it. Count me in. Please count me in Ryan – Would love to fish with you again. I would love to join you on this trip Ryan! Tight lines from The Netherlands. Count me in! Thanks for the opportunity Ryan. count me in! would love to have the opportunity to refine my skills! Ryan, I would love the chance fishing with you. with all the knowledge you have to offer it would be a great opportunity. i would love an opportunity to go on a fall run surfcasting trip. Ryan, I would thoroughly enjoy the chance to fish & learn from you. I got back into fishing for Stripers 2 years ago after a 20 year hiatus. What a waste! I’ve been researching techniques online and reading many articles. When doing a search, your name always came up. I joined last spring at an expo you gave a speech at. It was very enlightening which made me join. I would love the chance to go with you on this trip. I’m in! We are new to the cape and our son would LOVE to learn from you!!! Hey Do I need to do anything to enter besides registering as a new member? I’m in!! Would love to gain some of your knowledge on surfcasting. I’m in. Will donate trip to a young person if I am selected. I am in…just let know when it is…I will pay my own way…just to be part of the event! Just confirm…and I will make hotel reservations. Hey Jim – you won! I’d pay to take a trip with the man himself Ryan collins!